Miniature Song BIRD EARRINGS - HAWK - Mini Colorful Spring Flower Garden Forest Animal Costume Jewelry - D - Small realistic handpainted dimensional resin charm, approx. 1" tall. 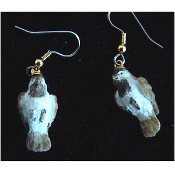 Great gift for bird watcher, tree hugger or nature enthusiast!